The ADC 5100E Single Handle Pocket Otoscope/Ophthalmoscope Set is a full-featured set sacrificing nothing but the size and bulkiness of ordinary sets. 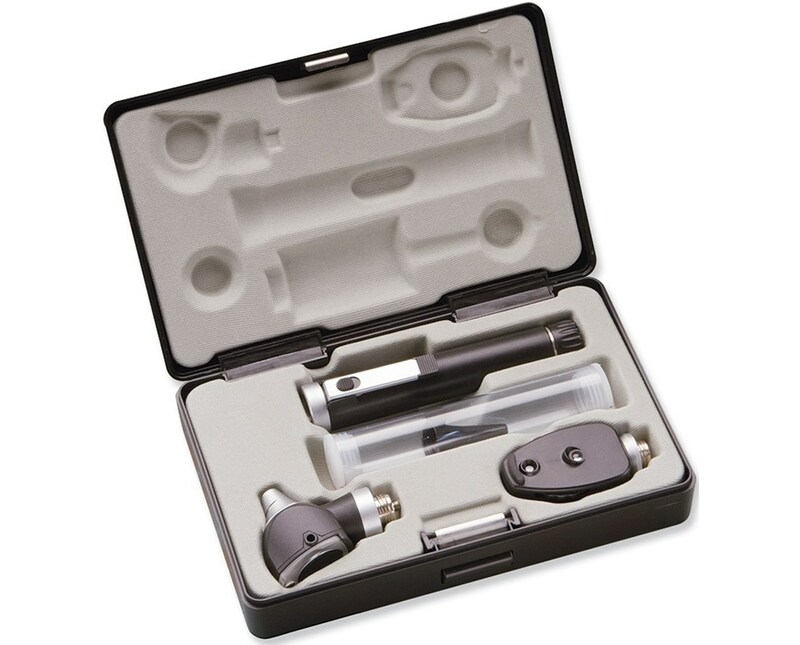 It includes one battery operated handle and interchangeable 2.5v fiberoptic otoscope/2.5v pocket ophthalmoscope heads. 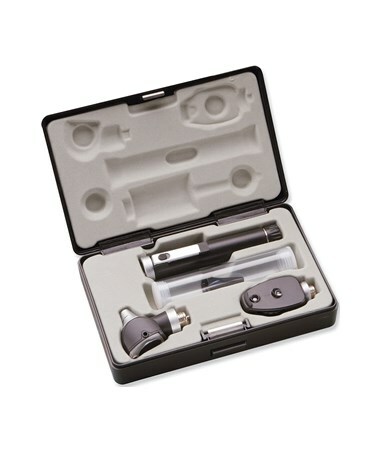 The pocket otoscope head features fiber optics for cool, obstruction-free light transmission, 2.5v Xenon lamp for true tissue color, a wide angle swivel 2.5x viewing lens to permit instrumentation, and an insufflator port for pneumatic otoscopy (fitting and insufflator not included). The head is made from polymid - an impact resistant space age thermoplastic. The pocket ophthalmoscope head features 5 aperture selections (small spot, large spot, semicircle, fixed and red-free filter), 19 viewing lenses from -20 to +20 diopters for better resolution, illuminated magnified lens dial, 2.5v Xenon lamp for true tissue color, and a rubber brow rest for optimal comfort. Like the otoscope head, it is made from polymid - an impact resistant space age thermoplastic. The ADC 5110E Single Handle Pocket Otoscope/Ophthalmoscope Set is designed for comfort and ease of use. Its AA battery handle has a convenient on/off switch integrated into the pocket clip for easy, ambidextrous use and clips individually and securely onto pockets. The entire set, in its hard fitted case, weighs less than a pound and fits comfortably in one's pocket. Your set is ready to use straight out of the box! For your convenience, 2 AA batteries are included for the battery handle. Additionally, the set includes a tube containing 5 each of Welch Allyn 2.75mm and 4.25mm disposable specula, sparing you the need to purchase additional accessories or scramble for batteries to supplement your new instrument set. The set arrives complete in a hard fitted case for portability and instrument protection. The ADC5110E Single Handle Pocket Otoscope/Ophthalmoscope Set will prove itself to be an invaluable asset to any physician. Its comfort and ease of use, small and lightweight size, and the features of a full-size set makes it the perfect and economical choice for regular use.